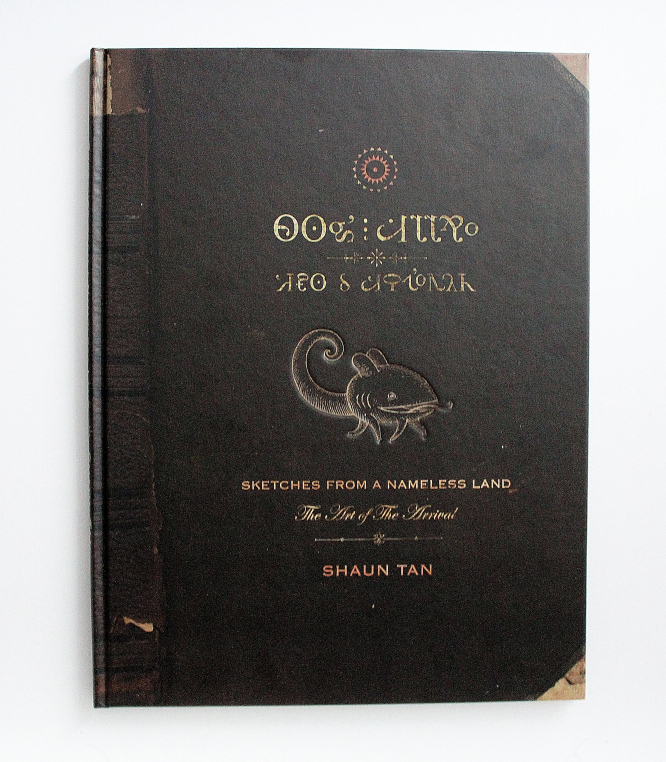 I recently acquired Sketches From a Nameless Land, The Art of the Arrival by Shaun Tan. The Arrival is one of my favourite books, and if you haven’t read it yet, it is a must read, and also a unique reading experience. It is 189 pages long and without any words. 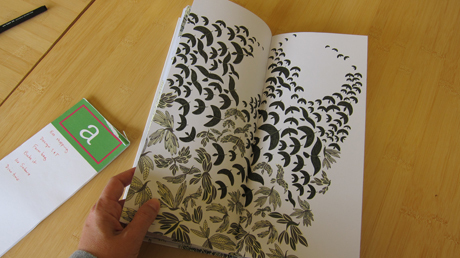 Sketches From a Nameless Land however is another beautiful book. It is a fascinating publication outlining the origins of Tan’s ideas, using examples from early research and his original before they were finished in the published book . I’d recommend this book to any person who has read The Arrival or who is a fan of Sahun Tan. Also I believe any aspiring illustrators would find it insightful to see how Tan drew inspiration from mundane objects around him in order to create the fantastical. 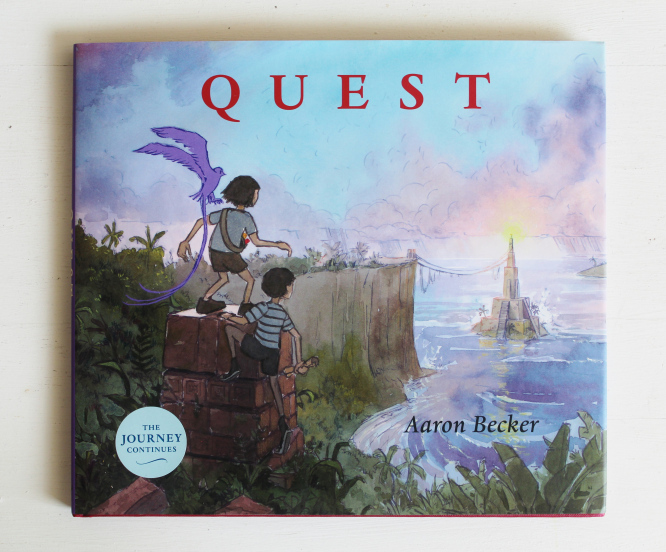 In the course of my studies recently on wordless picturebooks I was eagerly awaiting the arrival of this book to our bookshelves.Quest is the follow up book to Journey by Aaron Becker. These books are part of a trilogy, the last book in the series coming out sometime in the future. It is often the case in film s and books where the sequel disappoints, and this doesn’t break that trend. 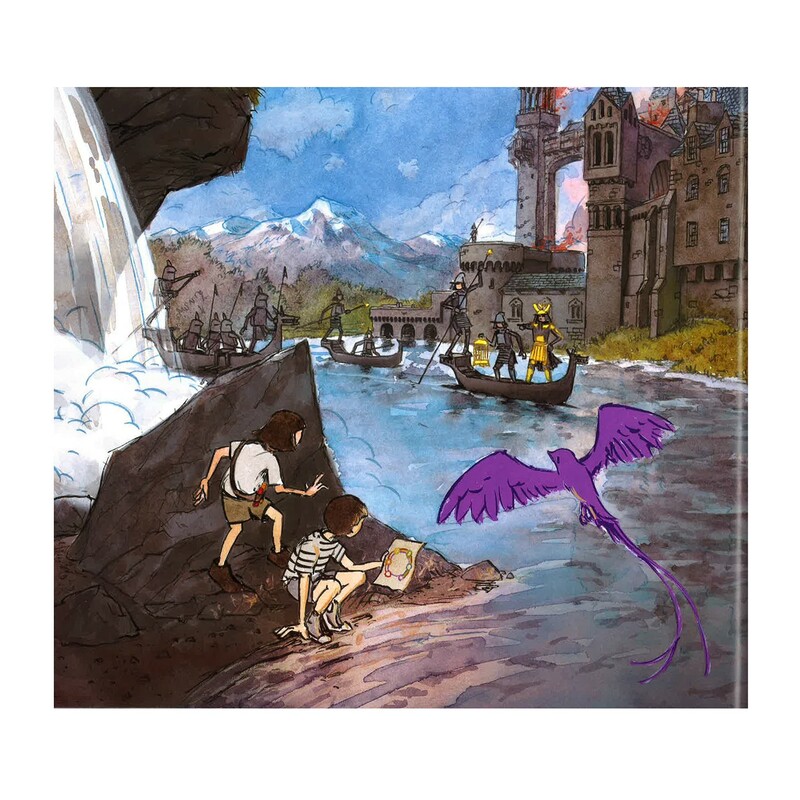 This book follows on from the first one, where the children in the story must find seven magic colours to free the captured King in the imaginative city the story is set in. The children must travel to different areas to find these colours. 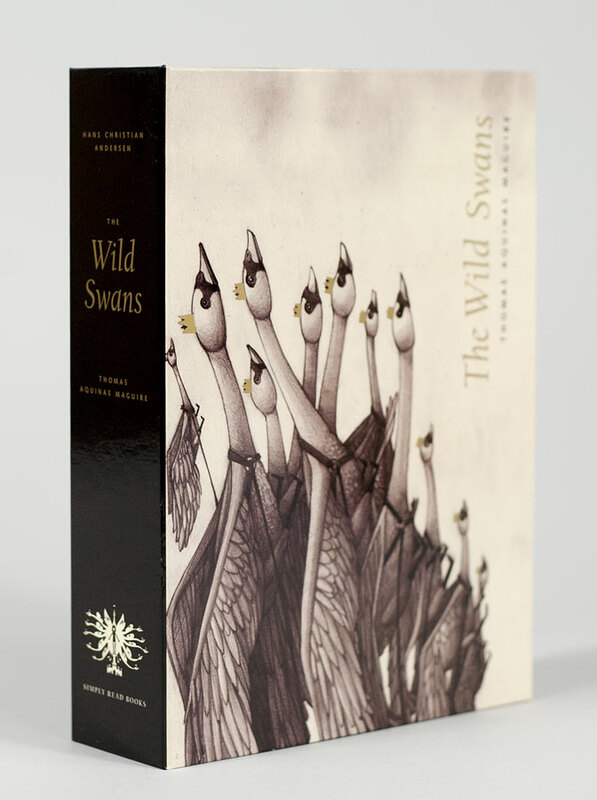 The book is exquisitely illustrated. Becker has a real talent with watercolours. The scenes are done in minute detail and I found myself pausing on some pages to take in all the effort the illustrator had put into the objects displayed on the page. I enjoyed this book but I mist say I was a little disappointed. Journey was a breathe of fresh air when it first came out as it was different and aesthetically it was near perfection with it’s warm colours coupled with expansive landscapes of a different world. Quest however is more or less the same book, I know books in a series have to have links but I looked forward to viewing a different kind of world, and a more original story. Journey was interesting as we did not know where the story could bring us but the story in Quest is so linear, the colours are going to be found and the king is going to freed, there is no complication as such. I feel the beauty of wordless picturebooks is that there is a wide room for interpretation in the images. In this book I felt the scope for interpretation was limited . Did you read Becker’s books? I don’t think anyone can argue against the illustrators talent or the books beauty. I enjoyed this book but not as much as I did with Journey. I look forward to seeing more of Beckers book, I love going on his website http://www.storybreathing.com to see how he puts his book together. He’s an interesting man! The box itself is a thing of beauty, full of dark shades and gold print, I was extremely careful opening it up. Inside contains what seems like a huge bundle of card, carefully one must begin at the start and work their way through the story, it can be difficult at times to handle, but the effort is well worth it. There is a feel about the box and story itself that it was specially made for you, it feels like a rare item that must be cherished. The pages are shown here. Maguire has an unusual style of illustration, there is something dark and grotesque in his drawings but they are stunning. The book is done completely in greyscale. The Swans and the young girl Eliza are beautifully drawn in the story, the landscapes are painstakingly detailed, ranging from palaces to forests to lakes. I could not help myself but marvel at the thousands of hours it must have taken the illustrator to complete this book. The narrative flows without difficulty, it is a long tale and the illustrations match that. I enjoyed the dark nature of the tale, it is a bleak version of Andersons tale borne out in pencil and black pen. 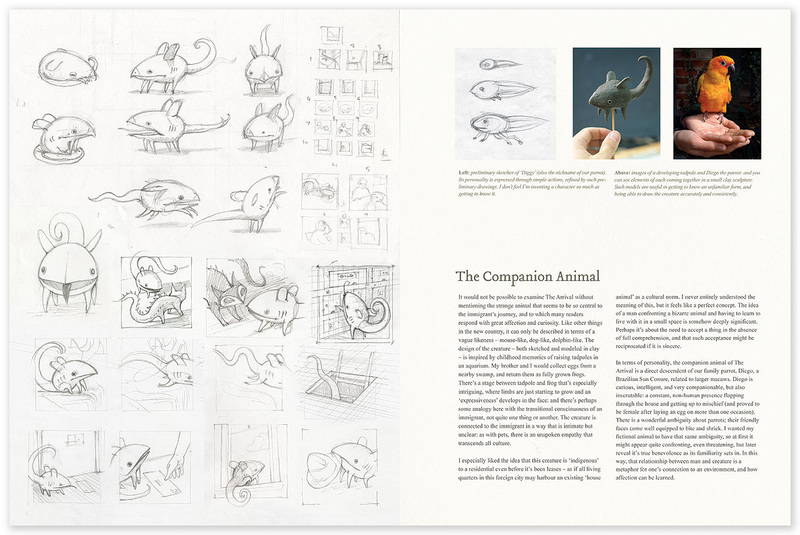 Here an example of some of my favourite illustrations from the book. 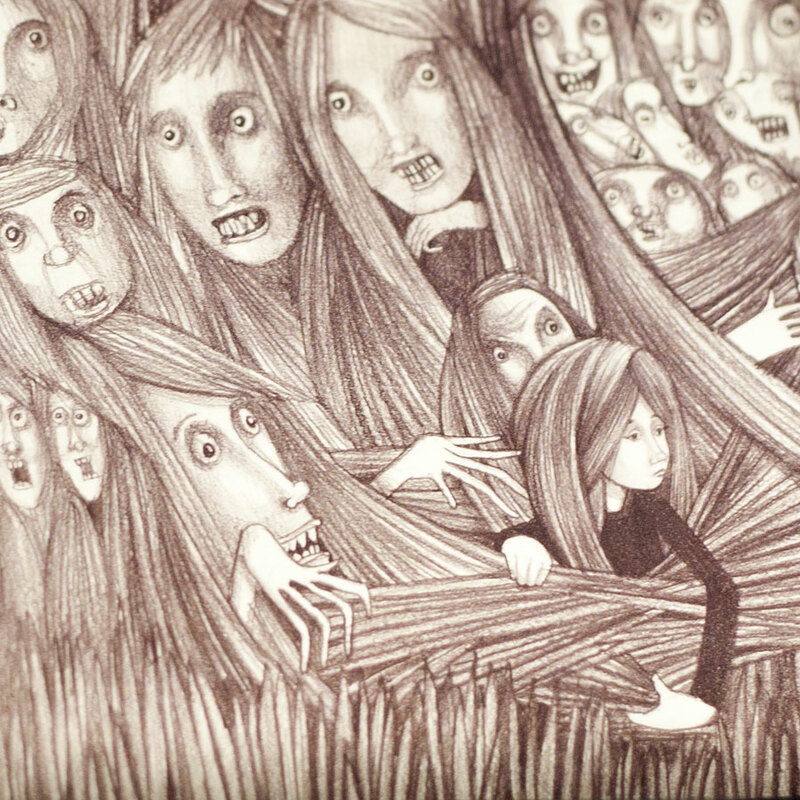 The above shows Eliza in the forest, it is an example of the sometimes disturbing nature of the drawings. 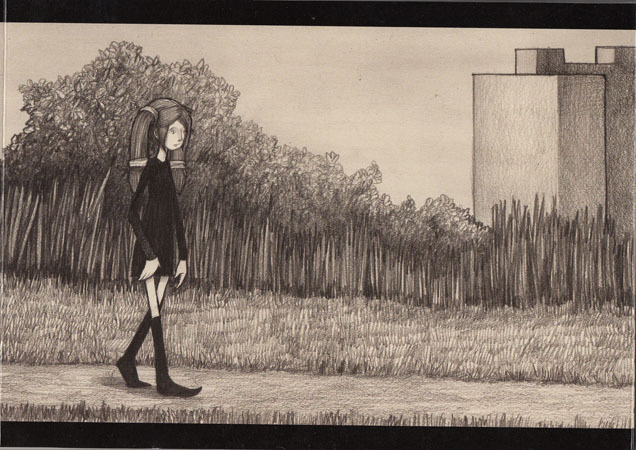 Eliza on her way to the lake, the shading and the grey tones really create a sinister atmosphere in the book. There is a grotesque nature to the creatures in the story, Maguire’s expert handiwork are shown here as the hair melts seamlessly into the background as Eliza is rescued by the prince. This book defies definition, I cannot emphasize enough how beautiful a piece of literature this books is. It feels like cheating calling it a book. It is a piece of art first and foremost. If you are into illustration or art work, don;t hesitate to buy this book. If you love picture books and are an adult, this is a must for you. Children could not enjoy this book, it is too dark and folding out the pages themselves would be an ordeal. This book needs to be cherished and looked after as a gift. As I said above, I felt that Maguire had handcrafted the box and book especially for me. Please leave a comment if you have any questions on this book as I know it is a difficult concept. It really is an innovative and outrageous book in certain respects. Let me know what you think! ‘Three Little Dreams’- A picture book, but not a book at all? 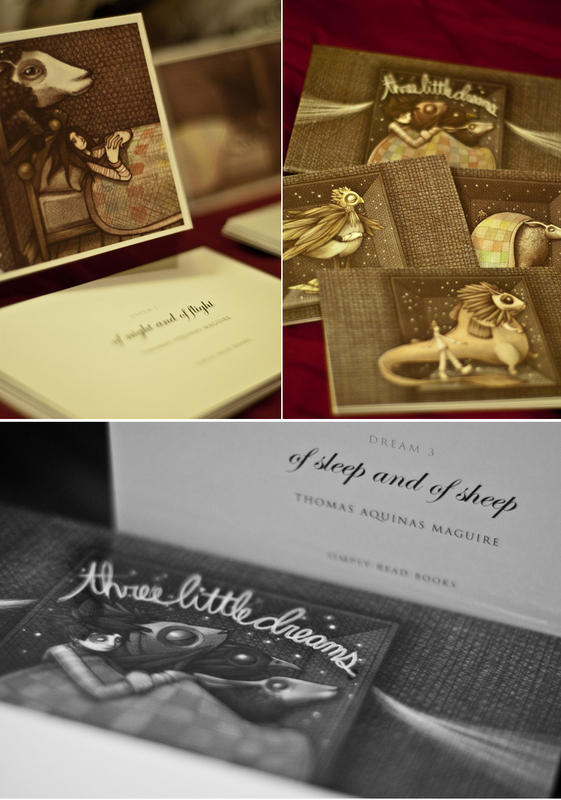 Three Little Dreams by Thomas Maguire is a very unique picture book. I like unusual books myself and I was eager to get my hands on this particular title. I was not disappointed. It is a picture book without words. It is presented in a beautiful box, as shown below. It is a compact box about the same size as a small novel book. Inside the box is three beautifully crafted stories. I’m unsure whether you could call this a book or a piece of art. It is a fascinating piece nonetheless. The stories themselves are three dreams. The stories are confusing as they have no beginning or end and each story is not a book as such. They are long fold out pages which extend about 6 feet long. The first dream is about a bird like creature(as shown below), the second dream is about a sheep like creature and the last about a flying tiger-serpent. I know this sounds like an odd book but that’s exactly what it is. It is not in the traditional book format with covers, the story neither has a beginning or an end and the story makes no sense in a way. This might be part of the whole dream concept the author is trying to create? I loved this book first of all for aesthetic reasons, the box is an item to be cherished, the books inside are beautifully crafted on card. The illustrations are beautiful, coloured in dark, bluish hues which add to the night time dream like state the book presents. I would not recommend this book for children as it is confusing and I don’t think it would appeal to them. I would recommend this title to a person who is into picture books or art. I feel this is a book which needs to sit on the shelf and to be explored from time to time. 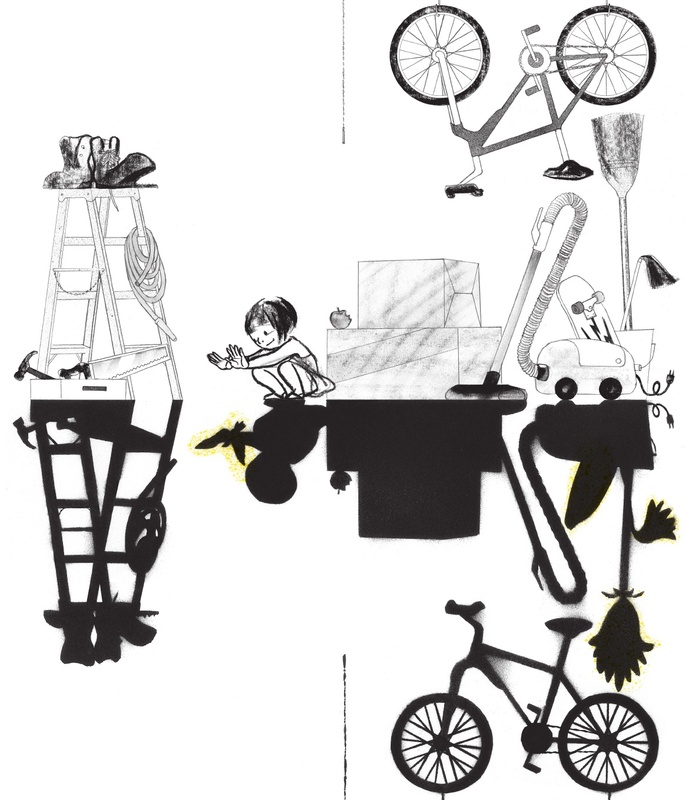 It would be a beautiful gift to receive as the illustrator has taken huge effort in the presentation of the whole item. This book will be kept safe and sound upon my shelf so it can never be damaged. 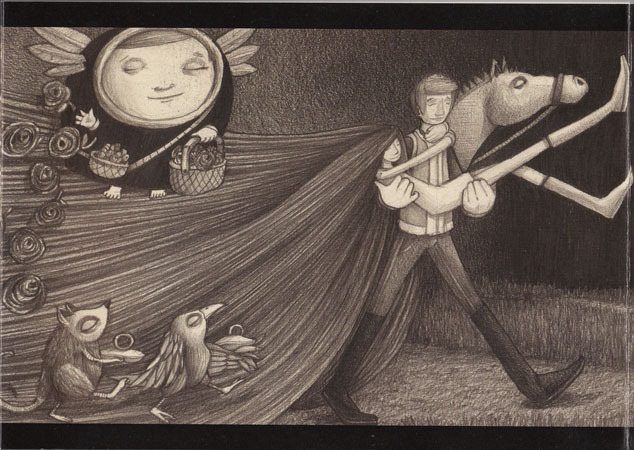 I didn’t enjoy the story I must say, but the illustrations are exquisite and the whole concept is so weird it adds to the unusual aspect of the book. 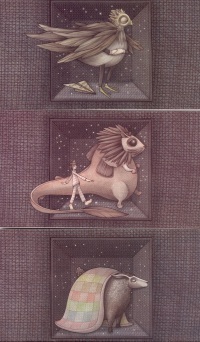 If you struggle to buy gifts for a person who is into illustration, I’d highly recommend ordering Three Little Dreams. 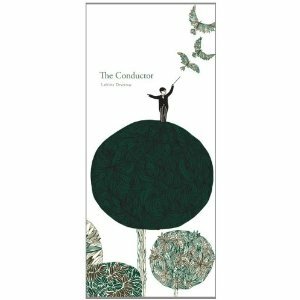 The Conductor by Laetitia Devernay is a wordless picture book which tells the tale of a conductor orchestrating the leaves off the tree’s. The book is very simplistic, it has greenish hues to it and is full of dark colours. The trees and the conductor are the only shapes present on most pages. I found this book to be beautiful but disappointing. From an artistic point of view I could not fault the illustrator. Her drawings are exceptional and have a minimalist beauty about them, they are meticulously executed. The best example being her ability to make the leaves take on a birdlike image as seen below. That said, I felt that not a lot happened in this book. The protagonist basically guides the leaves off the trees and that’s it. I had to re-read the book a few times to see if I could find another interpretation but sadly that was lacking. 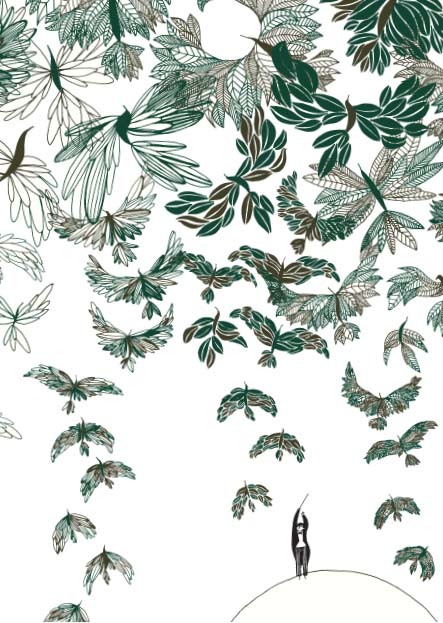 On a more positive note, the book is a communicative piece, as the leaves fly from the tree they take all sorts of highs and lows and the reader can almost hear the music or rustling the leaves must be making on each page. I think that this book wouldn’t appeal to a child as much as other wordless picture books such as Flotsam by David Weisner. There is very little play or amusement in the book. That said, adults would enjoy this books beauty. It is an exquisite piece of art. 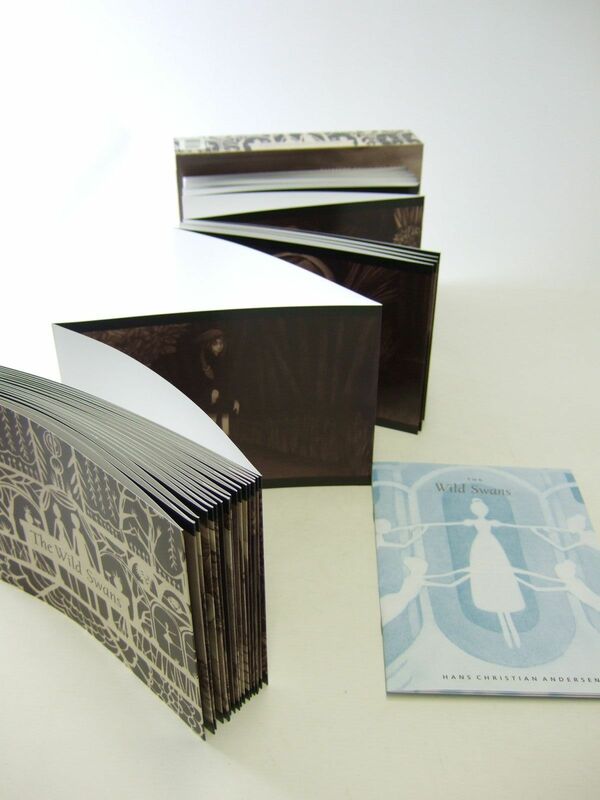 The book itself is a long rectangular shape which gives it an added aesthetic appeal. In summary, The Conductor is full of beautiful illustration but the story lacks the drama or complication that makes a good picture book. 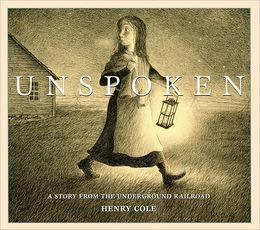 Unspoken: A Story from the Underground Railroad by Henry Cole is a wordless picture book set in the American Civil War. It tells the tale of a young girl who one day, whilst out in a storage shed, comes across a runaway slave/soldier. She helps the runaway for a couple of nights with parcels of different sorts and a touching story ensues. 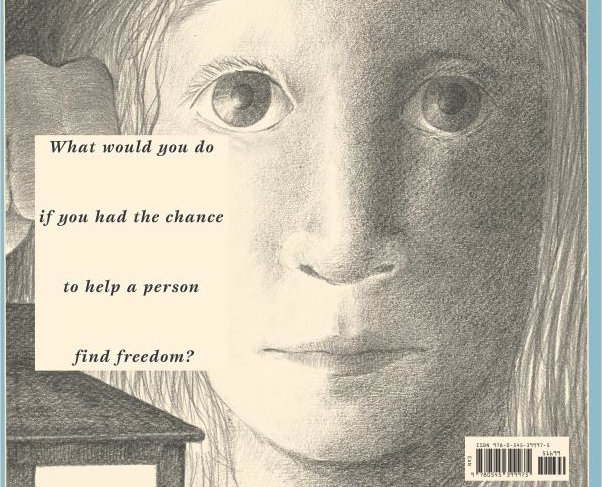 There is a powerful line at the back cover of the book coupled with a moving portrait of the young protagonist, the line poses the question before you begin to read-‘What would you do if you had the chance to help a person find freedom? The story is exquisitely illustrated, there is no colour in any of the pictures. The book is drawn using only pencil and sketching, it is also published using yellow paper which gives the book an historic feel. Cole’s use of line and shading to illustrate the story is impressive. Body language and his ability to show the fear hope that exists in a characters eye’s is breathtaking. 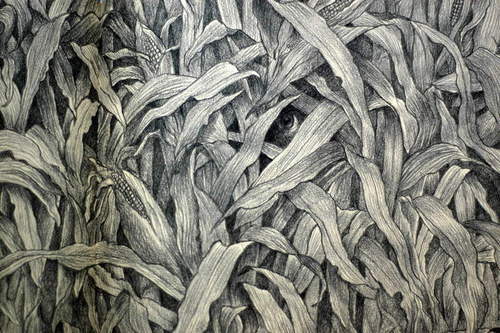 We never see the runaway, all we see is his eyes among the corn crop peeking out fearfully each time looking for help. Body language and the way it’s shaped tell so much in this book and Cole builds up a tension and suspense through this. The beauty of a wordless book like this is that children will actually tell you the story as they ‘read’ the pictures with you. However I feel a young child would not really understand the context of this book. Cole gives an historical explanation of the book from his own family’s experience in the Civil War in Virginia. He also doesn’t allude to whether the runaway is a slave or a soldier on the run. I love this book, it is minimalist but yet full of complexity, I admire the way it lacks colour, therefore, the book lends itself more to the feel of an American Civil War story. It put me right in the middle of a story full of tension, courage and bravery. The story underlines the point that some of the real acts of bravery during wars are not by soldiers or politicians, but by the civilians, no matter how young they are. I have never found this book on any shelves in bookshops in Europe or never mentioned on any recommended reading lists for picture books. It is a book that should have won lots of awards and have pride of place among the other greats of the picture book world. It would especially appeal to an American readership and would be an excellent book for educational purposes to explain how war is not all about violence and death. I would strongly urge you to order this book in your local library or buy it online, you will not regret it. I have been looking at wordless picture books lately and there is a surprising lack of them available. They can be harder to read than a conventional book with words, this is certainly the case with Shadow. 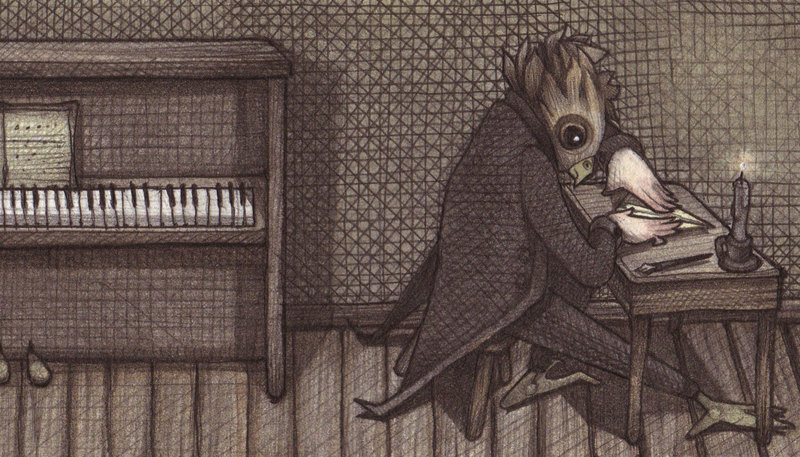 I’m fascinated by the ability of the illustrators to tell their stories without words. Journey by Aaron Becker is an example of a wordless picture book which has been a standout success lately, I’m eagerly awaiting his follow book of the trilogy, Quest. 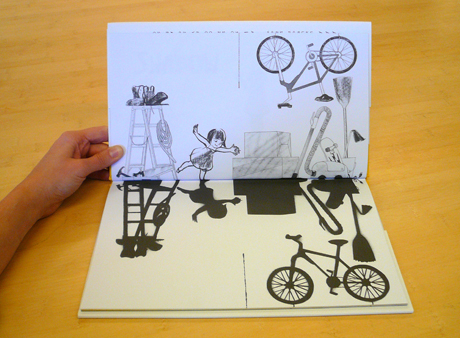 Shadow is a book by South Korean artist Suzy Lee. It is about a girl who is down in her basement and her imagination comes alive as she sees the shadows on the ground in front of her. 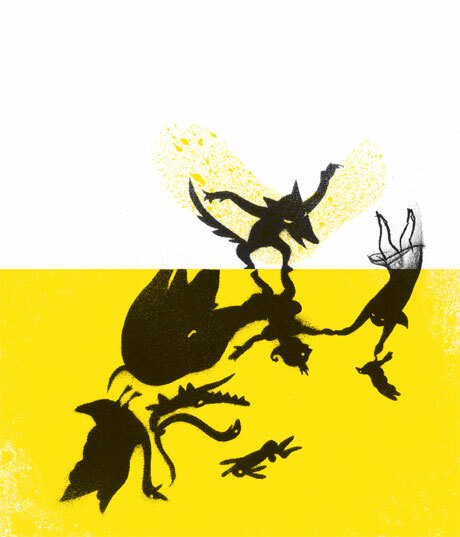 The beauty of the book lies in it’s ability to just use three colours-yellow, black and white. I think this adds to the book as shape is really important in the story as the shadows are cast and colours often distract from the narrative in picturebooks. Her use of line and body language in particular carries the story. Without words the artist must work extra hard for the story to make sense and flow. Lee achieves this to great effect. The book itself is unconventional, it is a long rectangle and it is difficult to read conventionally as one must open each page as a double spread and figure out the narrative. One page has what is happening in reality and the facing page shows the shadow cast and the imagination of the girls mind. She portrays a jungle scene by using ladders, chairs, vacuums and boots. The lines between reality and imagination become blurred quickly as the two worlds merge. Children love this book but it sometimes requires help to explain how to use the book before they begin to read. Children love to figure out what items cast certain shadows in the book and they end up trying to cast different shaped shadows themselves whilst reading the book! 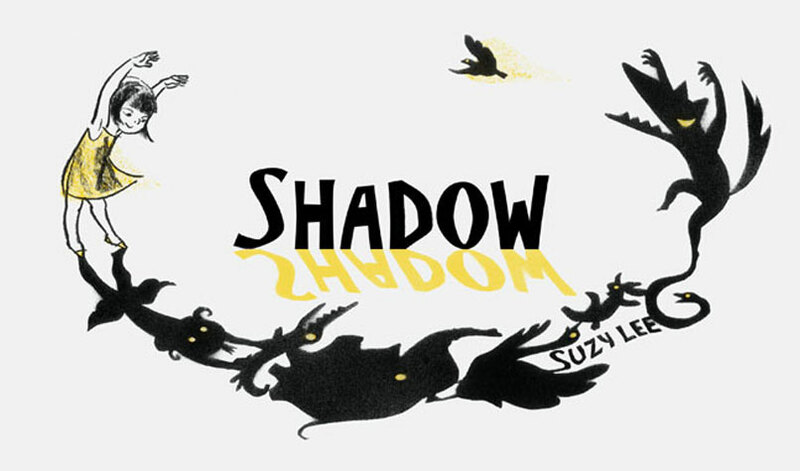 Shadow is a book like no other, it’s unique and simplistic like Suzy Lee’s other books which follow a similar theme, Wave and Mirror. It could also be a really cool coffee table book for adults as it is easy to pick up and look at a random page to try and figure out whats going on exactly in the narrative.